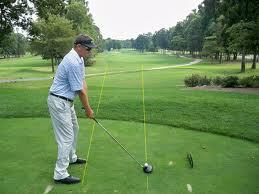 Lining up correctly is another important one that all golfers need to be aware of. As you play more holes in the course it is not uncommon that you may be lining up incorrectly, not straightly to the target or flag on the green. I found myself to strike a golf ball extremely cleanly, but the ball flies most of time a little bit to the right of target. I could not figure why. But the reason was that I was lining up wrong. My left foot was pointing to the target or flag, which encourages hitting ball to right. The easy way to make correct line-up is to think of two tracks of rail road. You body and shoulder should point a little bit to the left of target (assuming you are right hand golfer). Try to line up your body in line with lower track of rail road.